PES Club Manager is the best football management sim game to date. You will be in control of your team’s finances, attract sponsors and TV right offers, manage your home turf while keeping the revenue flowing from ticket collections, ad revenues and match rewards. You will also be giving tactical instructions to your players in live, real-time 3D matches. Your goal is to build a strong team from scratch and lead your club to victory. You will be locking horns with AI opponents as well as human-controlled teams. Football management was never this much fun! 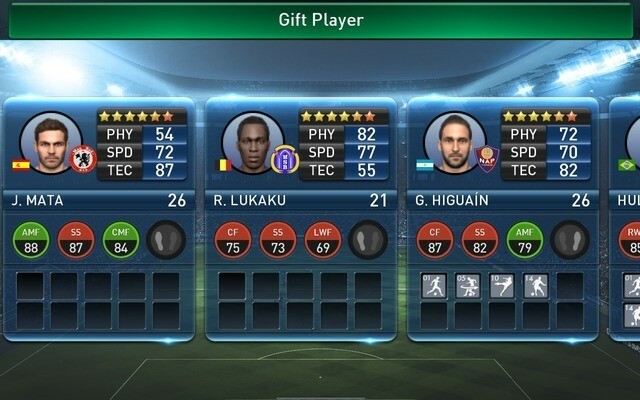 The first option will require you to spend PES coins + GP (in-game currency) to include them to your team. You may choose the bidding option, but chances of recruiting a player of your choice is low as other bidders may bid higher than the price you have offered. You may also be at a loss because you may be paying a lot more than the market price and the bidding process pushes the price higher than expected. Remember that this game is all about building the best team, and managing finances plays an important role in this. You will spend less money if you choose players from the youth team (third option). These players are quite young, so you will have a lot of time to groom them, and the best way to improve their stats is to play them in season matches. More play time to improve their stats + special training sessions = perfect recipe for a future star footballer. Here are some tips to build your dream team basing your team on the youth academy. 1. Build and upgrade your Youth Academy in your Home Town. Upgrading it will add better players to the Youth Team. 2. You will be able to see the “Youth Team” button soon after you have built the academy. Swipe left and tap on the button to access a list of young players. 3. Select at least 1 or 2 young players every season. Remember that the list resets and shows a different set of players after every season end or after upgrading the youth academy. 4. Always sign one or two players with high-rarity. Avoid one-star players and choose the ones that have at least 3 or 4 stars. You will get better players once you upgrade the Youth Academy. 5. Sell your aging one-star players from your current team and replace them with young players selected from the Youth Team. Go to “Player Management” and tap on “Players”. Start with one-star players with low stats and then go for two-star players that are over 30 or might retire. Old players’ stats decline once they hit the age of 30. 6. Replace old players with new ones; keep playing youngsters to improve their stats and don’t forget to spend training cones to give them a permanent stats boost. Make sure you play more matches and let the training cones accumulate (you win training cone(s) after each win). 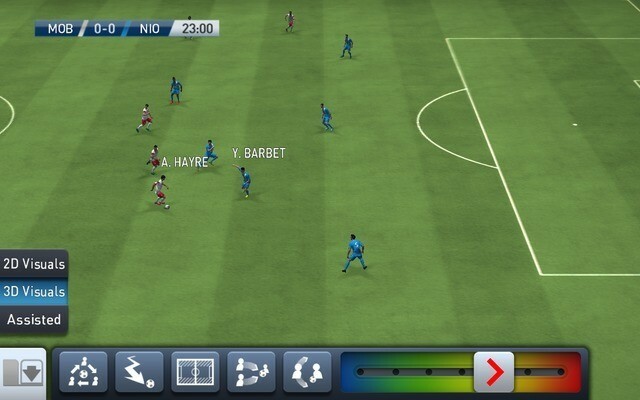 PES Club Manager’s match mode shows real-time matches in full 3D. 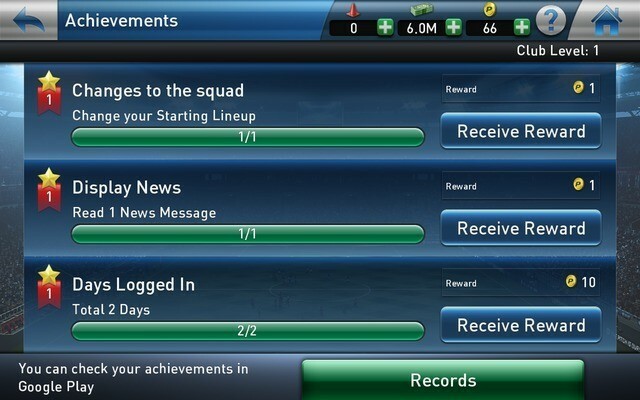 Not only you can view soccer matches on your mobile phone screen, but also deploy tactics and set up advanced strategies to tackle tricky opponents. In match-mode, you can give tactical instructions to your players using the menu at the bottom of the game screen. 1. I always go for “Possession Game” under Attacking Styles. You can have your own attacking style or may prefer counter strike over possession. 2. Choosing Possession and Short Pass under “Build Up” will ensure the ball is in your team’s possession for a longer time. And as you know, the team that has the ball has more chances of scoring. You may choose Counter attack, but then you will have to rely one or two of your strongest strikers to commit to the attack, take advantage of the loopholes in opponent’s defense to score a goal. This may or may not work, especially against a clever opponent. 3. The ATK/DEF slider lets you decide when to get into attacking mode or when to calm down a bit get into defensive mode. I move the slider to ATK + 2 when the ball in my team’s possession and all out ATK when my players have taken the lead and are approaching their goal. I switch to balanced or turn defensive when I see my opponents taking the lead. 4. There’s no best formation, but choosing a balanced formation with good players in your team can work wonders. I stick to the popular 4-3-3 formation (4-1-2-3 or 4-2-1-3) as it keeps a good balance between attack and defense. 5. Tactical presets play a key role in match mode, but don’t forget to have best-ranked players in your team. Choose players with high-rarity or the ones with the highest overall rating. Train your youngsters and play them in all matches to improve their overall ratings. 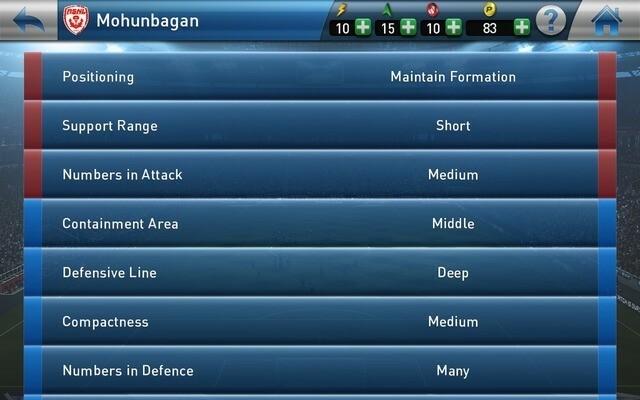 Tactical options are advanced strategies you can select just before kickoff. To access it, go to “Edit Team” and press the football icon at the bottom-left corner of the screen. Note that the Tactical options can be accessed via edit team option or before the start of play. – Maintain Formation. Probably the safest option. I don’t want my players to act out of their positions and ultimately leave a big gap in defense. I have more control in a match. Choosing this option will give you an opportunity to test other formations and see how footballers act on their positions. – Medium or Short. You will want to get several players behind the ball and ensure short passes are carried out successfully. – Choose medium but make sure you select “Many” under Numbers in Defense. Having several players of your team behind the ball will make it easier for you to get the ball back to their possession. The game will give you a chance to choose a star player at the very start of play. Select a player from the list of high-rarity player profiles under “Gift Player”. Make sure you choose someone with multiple skills and better overall rating. If you look at the screenshot above, the best three positions (AMF, SS, CMF etc.) are shown below each player’s profile name and age. The numbers indicate the overall rating or how strong your starter player is in each position. Choose the ones with higher overall ratings. 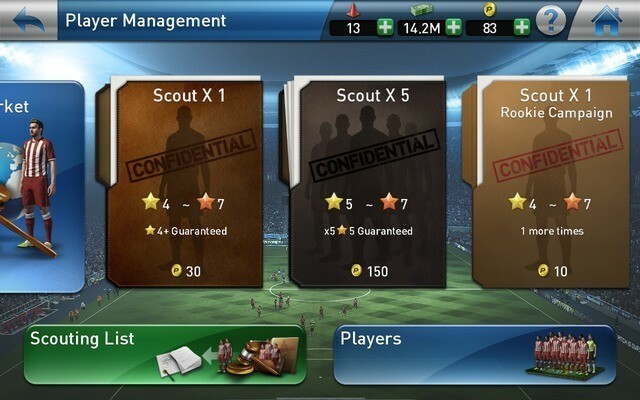 With PES coins, you can send out your scouts to discover established and licensed players if you don’t like to search them via the bidding system. Go to “Player Management” to get a random super star player. You will get a guaranteed 4+ star player by spending 30 coins, whereas spending 150 coins will give you players with rarity between 4 and 7. 1. Choose the 7 Day Coin Package to get 15 Extra Coins at the end of the seventh day. 2. Look for unlocked achievements. Completing simple tasks will earn you coins among other rewards like training cones, stamina and motivation. On your home screen, swipe left to go to the Achievements section and claim your rewards. 3. Sign up for TV rights to receive coins as well as bonus coins in case your team wins all soccer matches in a row. 4. Build and upgrade “Office Building Site” in “My Hometown” to increase the amount of coins you receive in TV rights. 5. Tap on “News” to check out any updates by developers. You may receive coins as rewards or compensation for server issues. For each day you log in, you will receive PES coins. These are premium currency with which you can speed-up construction/upgrades, recruit new players and buy items from the shop. You will be offered two log-in reward types – the 3 Day Plan and 7 Day Plan. 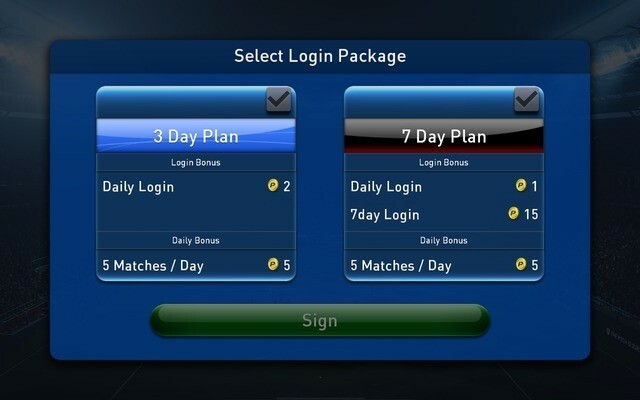 The 3 Day Plan gives a flat 2 PES coins as your daily log in bonus, but the 7 day plan gives 1 PES coin as daily login bonus and 15 bonus coins after 7 days. Make sure you log in daily. Hello there, in PESCM, I’ve got modric and other big names nearing to retire in amateur division with just 100 appearances. Is it better to sell or retire them ? Since I’m very keen to get them back to my dream team, How can make them reappear on my team? Never sell, especially if they are 5-star or above players. Always retire as you can convert them to trainers/special coaches.